The Korean War Veterans Memorial was dedicated in July 1995, forty-two years after a tense stalemate was reached in Korea, twenty-two years into the period of the all-volunteer military in the United States, twenty years after the fall of Saigon, and just a few years after the collapse of the Soviet Union and the end of the Cold War. It is the first of many memorials built on the Mall in response to the Vietnam Veterans Memorial. It began with a fairly straightforward, not unreasonable desire for acknowledgement of service in the Korean War. 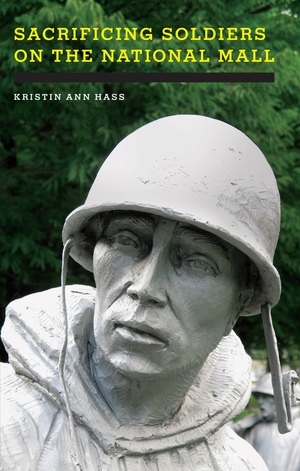 However, in a long, fraught process, the American Battle Monuments Commission, the Korean War Memorial Advisory Board, and various commissions in Washington charged with getting the memorial built sought to use what they understood as the "blind devotion" of soldiers from a "simpler time" in a national recovery project. The veterans who wanted a memorial sought to see their service valued; the builders of the memorial wanted to rewrite the social position of soldiers and soldiering in quite specific terms: they wanted to foreground the service of manly, heroic soldiers. They were not interested in the details of the war in which these soldiers had fought; they were, in fact, invested in obscuring the details of the war with larger-than-life figures of soldiers. These desires were played out in a complicated memorial process and produced looming gunmetal gray figures that haunt the landscape of the National Mall. South Koreans often call this "the 6/25 War" because it started on June 25, 1950. This makes sense in the context of Korean history; it marks the war as another event in a long series of struggles against colonial rule. The 6/25 War grew out of the problem posed by former Japanese colonies in the post-World War II period. Korea had been essentially under Japanese rule since the Sino-Japanese War ended in 1895. When the Japanese surrendered in 1945, both the United States and the USSR had troops and interests in Korea. Following Japan's surrender, Korea was hastily split in two at the thirty-eighth parallel. The United States stayed in the south and the Soviet Union stayed in the north. The country was to be run by a joint U.S.-USSR commission for four years, at the end of which Korea would reunify and govern itself independently. United Nations Security Council Resolution 82 called for North Korea to withdraw and supported a UN effort to defend the South. U.S. and South Korean troops did most of the fighting and dying. They were, however, joined over the course of the war by soldiers from Canada, Australia, New Zealand, England, France, the Philippines, Turkey, the Netherlands, Thailand, Ethiopia, Greece, Colombia, Belgium, South Africa, and Luxembourg. When the mostly U.S. and South Korean forces crossed the thirty-eighth parallel into North Korea in October 1950, the Chinese entered the war to support the North Koreans and their interest in maintaining communism in Korea. The war lasted three years, during which 273,127 South Korean soldiers and an estimated 520,000 North Korean soldiers were killed. A total of 114,000 Chinese soldiers and 54,246 American soldiers were killed. Roughly three million Korean civilians lost their lives. The war ended in a stalemate that has lasted fifty-five years. A demilitarized zone-2.5 miles wide and 155 miles long-was established at the thirty-eighth parallel. Uninhabited by humans for so long, the DMZ now holds interest for wildlife biologists. (Species of birds struggling in other parts of Korea-ruddy kingfishers, watercocks, and von Shrenck's bitterns-thrive in the DMZ.) But it is not abandoned. The length of the DMZ is vigilantly policed on both sides, keeping the war on the Korean peninsula very much alive. This gives the term forgotten war an awkward resonance. It was the first hot front in the Cold War. It was the first proxy war of the Cold War, the first war in which the superpowers used the bodies and territories of others to wage war. Given the way that the tensions in Korea have heightened rather than abated in the post-Cold War era, "the war that stays alive" might be a more accurate description. But this is not what is remembered at the Korean War Veterans Memorial. The memorial has three central design elements, each with multiple dimensions. The largest and most striking element is the triangular Field of Service, which slopes slightly upward and is populated by nineteen statues of seven-foot-tall soldiers clad in ponchos and helmets. Made of stainless steel with a rough, deeply textured, unfinished patina, they have exaggerated, oversized facial features with great, hollow, empty eyes. Like a battle-ready combat troop, they appear to be marching up a gentle incline on the Mall. They are armed, but their weapons, which are not raised, are partially obscured by the bulky ponchos. The soldiers seem to move forward by steady plodding, rather than with speed or determination. The field through which they walk is planted with low shrubs and divided by nineteen long, low, black granite slabs, which carve up the field and mark it as off-limits to visitors. Although their attention is scattered-some face forward, some turn to engage another figure, others look wearily over their shoulders-they appear to be marching together toward the enormous American flag at the top of the incline. The second major design element of the memorial is the black granite Mural Wall that runs parallel to the Field of Service. It resembles the wall of the Vietnam Veterans Memorial in that both are long, black, reflective expanses similarly situated at the base of the Lincoln Memorial. But, in several crucial ways, the wall of the Korean War Veterans Memorial is quite different. It is not carved with the names of those killed in the war, but etched with images of more than 2,400 soldiers and military workers. Photographs from the National Archives emerge from the dark stone in varying sizes and degrees of clarity. Crowded together in some places and separated by expanses of black in others, they seemed to be placed randomly. They are, in fact, placed in a pattern designed to evoke the mountainous terrain of Korea, but this is nearly impossible to see. The images themselves also are not clearly visible, but must always be deciphered through the reflections of the nineteen figures and the reflection of the viewer looking into the granite. It is a murky wall, but also a living wall-its figures are very much alive and engaged in the business of war; they are not inert, tragic, named dead. U.S. vital interests in Korea were certainly complicated, but leaving them undefined leads to further complication. Writing about the Cold War in Asia, Christina Klein contends that "the political and cultural problem for Americans was, how can we define our nation as a nonimperial world power in the age of decolonization?" The language of the memorial is stunningly generic; the only substance it offers is the soldiers' service. Domesticating the war in this way-focusing on the soldier rather than what he or she did in the world-avoids the problem posed by Klein. At the same time, it provides the answer to her question. Emphasizing the soldier and evading the war's context allow the nation to be defined as a "nonimperial world power in the age of decolonization." This strategy is used throughout the memorial. Shifting the emphasis from the war to the soldier also speaks to the needs of the military of the moment-the thorny problem of recruiting for an all-volunteer military. More information about the Korean War might have complicated the memorial's statement that "Freedom Is Not Free." The shift to the soldier avoids the vital interests of the past to address the vital interests of the present. If you are not too distracted by the confusingly competing elements of the design, if you simply stand still before the figures of the soldiers and look at their faces for a while, the commemoration of the soldier is further complicated. The figures' faces are not uniform, like the language of the inscriptions, and they are not generic. They are hollow-eyed, tense, and often contorted. They are, in fact, painful to look at. The rough finish, the blank eyes, the sheer bulk of them, the distracted scatter of their postures-all make the figures both powerfully present and hard to read. Their ghostly, sometimes twisted faces are remarkably moving-they seem to express not platitudes but something of the anguish of the soldier's experience. The Korean War Veterans Memorial (KWVM) is one of many memorials built and debated in the memorial-building frenzy of late twentieth-century United States. It is the product of a time in which the desire for memory in a national context was intense. The Ninety-Ninth Congress, which initially approved the KWVM in 1985, also approved two other major memorial projects: the Black Revolutionary War Patriots Memorial and the Women in Military Service for America Memorial. Before the Vietnam Veterans Memorial was approved in 1979, more than forty years had elapsed since the last major memorial was built on the Mall, and no national war memorial had ever been built on the Mall. In the twenty years after the Vietnam Veterans Memorial was completed, four major war memorials were built on the Mall. At leastnineteen others were vying for space. These memorials are explicitly and determinedly part of a struggle to rebuild American nationalism in the wake of the Vietnam War. The way the Vietnam War was waged, the logic that drove the war, and the kind of nation the war imagined were profoundly disruptive of U.S. nationalism in this period. The problem was not simply that the war was unpopular or that the draft was unfair or that rebellious youth did not want to serve. All this was compounded by the powerful voices in the United States who wanted to see Americans as the people who brought the world freedom in the Second World War rather than as the wagers of an unwinnable, unpopular, complicated war in Southeast Asia. Many Americans seemed to want to understand themselves as a nonimperial world power in the age of decolonization, rather than an imperial global power waging the Cold War in newly claimed former French, British, and Japanese colonies. This desire drove the push to build these memorials. The problem of military service in this period was pertinent and pressing for these memorial projects. The all-volunteer military had, much to the surprise of many, a very successful beginning. In 1973, 1974, and 1975, the army's modest recruiting goals were easily met. But by 1976 recruitment had clearly slowed, and by 1979 there was a 16,000-person shortfall that inspired army chief of staff General Edward Myer to tell Congress that the nation had a "hollow Army." The army responded with increased salaries, increased incentives, and the "Be All You Can Be" advertising campaign. The Vietnam Veterans Memorial was hardly helpful in this context; the Wall wasn't an appealing companion to these campaigns. When the Korean War Memorial process began, Selective Service registration had recently been reinstated in response to the Soviet invasion of Afghanistan. The Department of Defense was worried about what would happen if some political incident required a sudden increase in volunteers; there was a lot of anxiety about the feasibility of an all-volunteer military in a wartime situation. As a result, even though in the late 1980s and early 1990s the military reduced its size, dramatically contracting the need for new recruits, the Department of Defense continued to need to raise pay and improve educational benefits in an effort to meet recruiting goals. These recruitment issues would certainly have been on the minds of some of the memorializers. The story of the building of the KWVM, the debates it engendered, the debates it did not engender, the questions the memorial process raised about the nation, and the figure of the soldier are all linked to difficulties in reconciling old ideas about the nation and the new kinds of wars it was waging. The looming, pained soldiers at the center of this memorial are celebrated and sacrificed. The war in which they served is obscured in the memorial process. The rough, raw faces of the statues emerged from the battle over the figure of the soldier, embodying the struggle to move from the real, complicated experience of soldiers to a positive representation of the willingness to serve that might act as a corrective to the abstraction, the ambiguity, and the grief represented at the Vietnam Veterans Memorial. The Korean War Veterans Memorial is not simple, but it strives to simplify and domesticate war and military service. Where is the Korean War memorial? Somehow I never can find that. Both the Vietnam Veterans Memorial and the National World War II Memorial have well-worn origins stories. Jan Scruggs came home from seeing The Deer Hunter determined to heal his national community. A constituent approached his congresswoman at a pancake supper in Ohio to ask her why there wasn't a World War II memorial, and the lawmaker, stunned by the realization that there wasn't one, embarked on a great crusade. In the case of the Korean War Veterans Memorial, the impetus is probably also best traced to Jan Scruggs and The Deer Hunter. In newspapers, congressional arguments, and presidential speeches, the answer to the question, "Where did the drive to build the Korean War Memorial come from?" was almost always linked to the Vietnam Veterans Memorial. Crucially, there were two parts to these references to the Wall. The first was essentially that Korean War veterans should have a memorial because the Vietnam veterans have one. The second was that there should be a war memorial on the Mall that is not the Vietnam Veterans Memorial-not abstract, not about grief, not about loss, not about tragedy, not about the nation imagined by the Vietnam Memorial. Each day I admire the altogether fitting and proper memorial statue honoring the courageous lads of America who planted the flag on Iwo Jima during World War II. Now I'm wondering if there is a memorial somewhere for the equally courageous boys of United Nations who fought under many flags, including our own and that of the United Nations, to stop the aggression of the North Korean and Red China communists on the Korean peninsula. That was a notable landmark in world history, when a number of nations joined together to stop an aggression which touched them only indirectly. Men of all races and creeds died for freedom there. Should not there be a monument showing the heterogeneous qualities of those united forces? Would not that serve to remind us and others that even the "little wars" against free people (or even against unfree people) are important today? Borrowing Lincoln's language at Gettysburg -"it is altogether fitting and proper that we should do this"- G. Holcomb offers a complicated vision of what could be remembered about the Korean War. He foregrounds the "courageous boys" but suggests that what should be marked about the Korean War is that it was waged by the United Nations and fought by men of "all races and creeds." When he asks, "Should not there be a monument showing the heterogeneous qualities of those united forces?" he asks a powerful question. In 1955, memorials were not of much interest to most people in the United States. World War II was remembered mostly by local, living memorials, and renewed interest in memorialization was still at least twenty-five years away. In the immediate post-Korean War years, there were precious few letters to editors about Korean War memorials, and Holcomb's cause was not taken up. But what he suggests should be remembered-a newly heterogeneous military (or, perhaps more accurately, a newly desegregated U.S. military) and a UN fighting force-are worth noting because these striking, logical, obvious terms for remembering the Korean War of the 1950s were absent when the memorial process began in the early 1980s. They had been replaced by the memorial needs and desires of the 1980s. In the conversations about the memorial, responding to the Vietnam Veterans Memorial was far more pressing than remembering desegregated forces or a UN-waged war. Of course, remembrance on the National Mall of either race or a U.S. war fought multilaterally was thorny business, and these challenges did shape the memorial that was built. But, in the final design, both race and the United Nations are present only as traces. G. Holcomb was not entirely alone in his desire to see a memorial built. The American Battle Monuments Commission made some noise about raising funds in the mid-1960s. And in the preceding years, a few individuals tried to stir interest in a memorial. In Marlboro, New York, Eli Belil started pushing for a memorial in the late 1970s. Belil, a Korean War veteran and research director for Penthouse magazine, wrote letters to state and federal authorities, various veteran's agencies, and the American Battle Monuments Commission, but got nowhere. He encountered "official roadblocks, ignorance, and apathy when it comes to recognizing the sacrifices of those of us who so long ago fought and paid the ultimate price for freedom in a faraway land." It wasn't until the Vietnam Veterans Memorial (VVM) was built that any serious momentum was gained for a Korean War memorial. In 1987, Belil expressed a common sentiment when he said, "I'm not knocking the Vietnam veterans and the fact that their memorial is finally a reality, but like Vietnam, Korea was a battleground in which almost as many men lost their lives over a shorter period of time.... [A]ll they have to show for it are a few fading pictures ... and the scars that neither time nor the Government's apathy will heal." Belil attributes the pre-VVM lack of interest to the Korean War veterans' unwillingness to "make waves," indicating a generational difference between the Vietnam and Korean veterans but also implying that, before 1982, getting a war memorial built required making special, disruptive demands that the proud (and maybe more compliant?) Korean War veterans were unwilling to make. Holcomb was interested in remembering the war in the context of world history. Belil and the voices that emerged after the Vietnam Veterans Memorial was completed were interested in something else: recognition for individual sacrificing soldiers and the need to heal. The closest the KWVM gets to an origins story of its own dates to 1981, when Chayon Kim, a Korean-born naturalized U.S. citizen, formed the National Committee for the Korean War Memorial. Kim's life had been saved by American troops during the war. She would later recount hours of "huddling in a bunker while American B-29s dropped bombs on North Korean troops all around her hiding place." Inspired by a meeting with Mrs. Douglas MacArthur, Kim established a memorial committee comprising a few self-appointed individuals without governmental affiliations. Just one month after the spectacularly successful dedication of the Vietnam Veterans Memorial, in December 1982, Kim was removed from the committee. Two years later, the committee dissolved in the face of serious financial improprieties. One-time committee member Myron McKee had taken advantage of veterans' desire to see the memorial built as a way to line his own pockets, paying himself $650,000 to raise $600,000. Before this happened, however, Kim's committee did make a couple of key contributions to the memorial process.